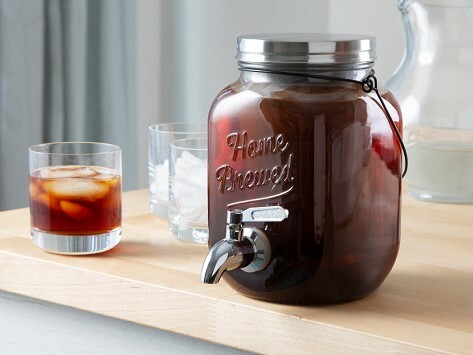 Cold Brew on Tap 2.0 delivers fresh cold brew coffee, easily made by you. The glass container and fine mesh stainless steel filter brews about a week’s worth (around eight to 12 cups) of cold brew in one go. You can store and serve it straight from the fridge. The rust-free lid seals the brew in and keeps it fresh for up to two weeks, and the filtered spigot makes for easy, grit-free pours. Dimensions: 10.6" x 9" x 7.2"
I made my coffee a little strong the first time. It is so cute!!! I love it!! A great way to have iced coffee!! You will get a card in the box telling you to text to a number to receive use/care and brewing instructions. They won't answer the text. Many of us in the office take coffee pretty seriously and we all applaud the way Camille and Ben’s approach streamlines the process.